It is sound business practice to have all your affairs in order. Part of having your affairs in order is having a valid North Carolina will in a safe place and possibly one at your attorney’s office. No one wants to think about drafting a will, because it is painful to think about not being here for loved ones. But making the extra effort and taking time to execute a valid North Carolina will is the best thing you can do for your loved ones. Executing a will is a fairly simple legal process and can be done within a week. You may also need to update your will because circumstances have changed in your life. If you have been thinking about this and procrastinating, I completely understand. But, the nagging thought will not go away until you do something about it. Contact me today to discuss getting this albatross from around your neck once and for all. There is no consolation for the pain and immense grief of losing someone you love. It is a very sorrowful time and no one wants to deal with the legal aspect of this unfortunate situation. The Law Office of Victoria Broussard offers compassionate care when you need it most. When a loved one passes away there are two categories they fall into, either they passed with a will or they passed without a will. Either way, you will need to hire an attorney to either probate the will or file an application to determine heirship. If your loved one executed a will prior to passing, the legal road ahead is a bit smoother. All the attorney needs to do is file an Application to Probate the Will, which is usually filed by the attorney on behalf of the person named in the will as the Executor or Executrix. The attorney will need to follow a few steps laid out by the Texas Probate Code and the Executor or Executrix will be on their way to being able to administer the estate in accordance with the wishes of the will. Please be mindful of the fact that you only have four (4) years to file the Application following the passing of your loved one. If your loved one passed without a will, the legal road ahead is more tedious. It will take more time because the Texas Probate Code requires that we determine all the potential heirs are and provide them with notice of the Application to Determine Heirship. The Application is filed by an attorney on behalf of a person who is probably one of the next of kin to the deceased loved one. In this legal scenario, the state has a vested interest in making sure everything goes smoothly, so an Attorney ad Litem is appointed, which is the reason the filing fee for an Application to Determine Heirship is higher than most filing fees. We will also need two uninterested witnesses to attest to the family lineage of the passed away loved one, which aids the court in determining the rightful heirs. These witnesses will be required in court at the hearing. This particular requirement can be a stumbling block and cause the process to extend past expected time estimates. These hurdles can be overcome with a bit of patience and tenacity. There are occasions that require a person to file an application seeking a court supervised administration to gain a legal guardianship over an incapacitated person, a minor is also incapacitated, or over that person’s belongings. The court can appoint a guardianship over a person, which is called, quite naturally, Guardianship over the Person, or a guardianship over a person’s belongings and property, is called a Guardianship over the Estate. The need for a guardianship can arise in several instances. For example, if a person becomes ill or has an accident and can no longer care for themselves or handle their personal business affairs. The applicant will need to contact an attorney and file an Application for Guardianship along with additional documents proving the person they seek to care for has become a ward of the state and their ability to adequately care for themselves is greatly diminished. The Texas Probate Court does not allow Pro Se Applicants, you must hire an attorney to file the application. The court is very picky about who it allows to be guardians. If you have blemishes on your record, or have engaged in conduct unfitting, it is likely the court will not approve your application. There is a great and heavy responsibility on the shoulders of guardians and Texas has a vested interest in the well-being of the ward. If you believe you are in a situation that requires a guardianship and have questions, please call or e-mail me today to schedule a no charge phone consultation. Victoria Broussard recently relocated to Guilford County and is a proud resident of Greensboro, North Carolina where she will soon serve the community practicing family, criminal, and probate law. Ms. Broussard is an active member of the Texas State Bar and successfully serves the legal needs of her current Texas clients. 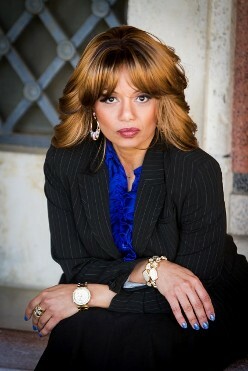 She is licensed to practice in the Middle Judicial District of Georgia and the Judicial District Court of Colorado. She is completing the licensure procedure in North Carolina and anticipates accepting her first North Carolinian client soon. "Victoria was very thorough and had undeniably researched all aspects that were going to be presented in my case. It was evident that she was fully prepared for each and every direction that was taken and could have been taken in my hearing. I sat in awe of her as I watched her knowledge and professionalism at work in the courtroom. I would highly recommend Victoria Broussard as she is a remarkable lawyer and I always felt that she was fully representing me and the best for me and my family." — S. McCauley, October 2010.